Disclosure: I received a Creative Baby i-Mat for review purposes. All opinions are 100% my own. When I first heard about the Creative Baby i-Mat I was intrigued. Who doesn’t like educational toys for their kids? It sounded like something my 2 youngest children, ages 23 months and 4 years, would enjoy. I knew right away that I wanted to get one for my kids. In anticipation of it’s arrived I showed my kids the video from the Creative Baby website. They were very excited to try it. When the package finally arrived, they couldn’t wait to try it out. 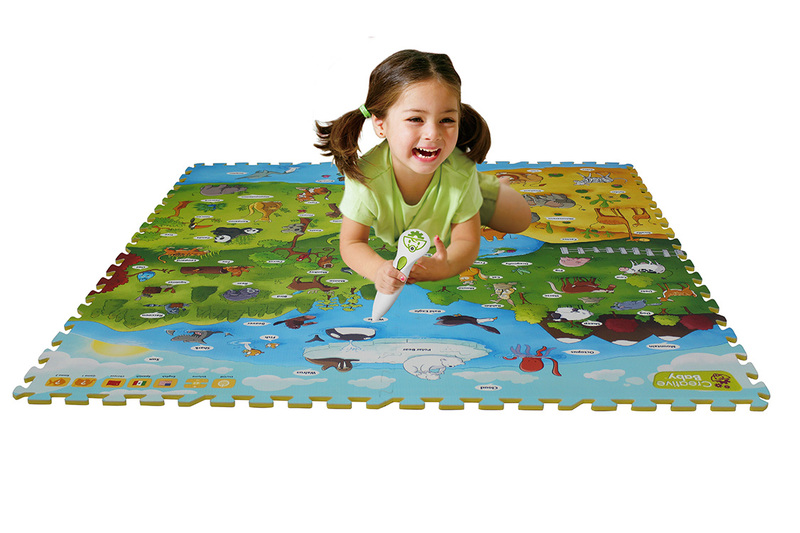 The mat is 4 squares that puzzle together to form the play surface. By the time I had the batteries (not included) installed, they had the mat assembled and were waiting to get started. When put together the mat is 47.25” x 47.25” and 0.4” thick. It is a really nice large area for the kids to play on and even on a wood floor is thick enough to be comfortable for long periods of time. 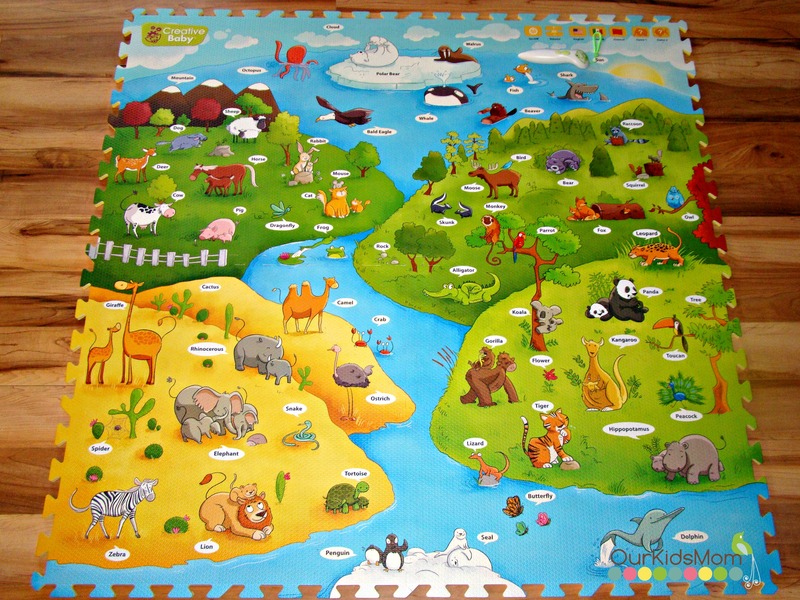 The mat and animals on it are divided into different areas. Farm, desert, jungle, forest, ice and water. I really liked how they did that instead of just randomly placing animals on the mat. My 4 year old had no trouble figuring out how to turn the pen on and start finding out what it would do. I have to say, I highly underestimated this toy. The i-Mat provides so many ways for interaction between my kids and the mat and as well as with each other. To my surprise, even my 8 year old has enjoyed playing with his sisters on the mat. He really enjoys learning the names of the animals in different languages and both him and my 4 year old love to quiz their youngest sister. They like to ask her where specific animals are or what sound they make. It amazes me how fast she is learning the answers. It is nice to see my children be able to use this by themselves and with each other and have fun both ways. My youngest (23 months) loves all the animals. She gets so excited when she touches the pen to an animal and it says the animal name and then either makes the animal noise or plays a little song. There are dozens of cute animals to choose from. Here is a short glimpse of my 23 month old playing with the i-Mat with a little guidance from me. The i-Mat interacts with the kids in 3 different languages. English, Spanish, and Chinese. It also has 2 different game levels. 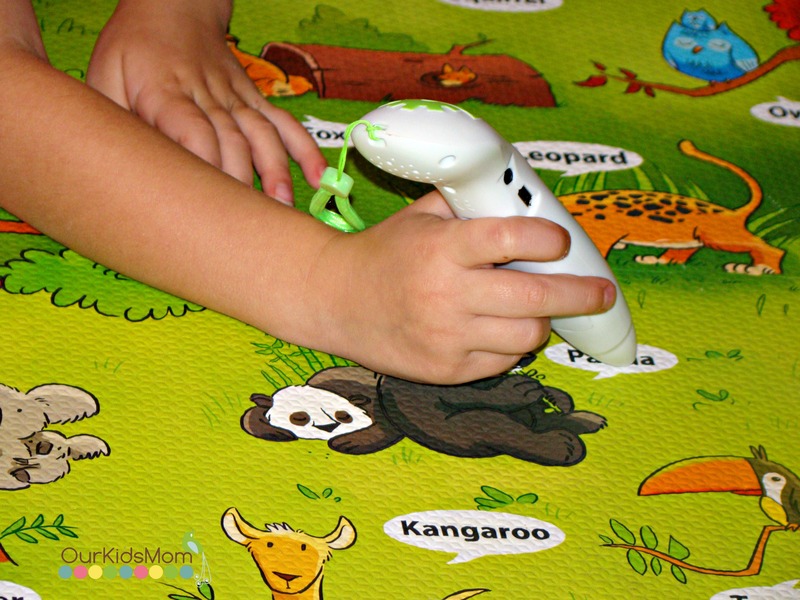 The first level asks the child to find a certain animal. It gives them 3 chances and then moves on to the next one. I really like that it will move on before they get discouraged or frustrated. It keeps the game fun. It is perfect for my 23 month old. The second game asks questions about an animal and the kids need to pick the animal that the question is about. For example, “Can you find the animals that are green?” or “Can you find the animal with a long nose?” or “Can you find the animal that says ‘Woof Woof’?” My 4 year old has really enjoyed this game. I love that I know my youngest is not going to outgrow this for a long time. Above is a short video of my 4 year old interacting with the i-Mat. The i-Mat would make a great gift for any toddler. It also comes with a USB port which is for future expansion capability. I am hoping that means they will be coming out with different themed mats. The current one is called My Animal World. You can pre-order now at www.creativebabyinc.com for $79.99 and also get free shipping. ONE OurKidsMom reader is going to win a Creative Baby i-Mat and pen! This giveaway ended at 11:59 PM EST on October 4, 2013.
very nice idea I love that they all were able to play with it I love that its educational and fun. so far it’s the only product on the website but seems really nice. I learned they test their products with families all over the world. Actually, I want the mat. Not only would my children be learning about so many different types of animals, but they could also have the option of learning a different language. I love what I see so far, and am really curious about new ones as well. Does it have a volume control? It seems loud is all. My son has special needs and would love to have this!! Not only would it help him learn, but he would be one happy boy, that’s for sure. Thanks for the opportunity! I love how their products stimulate the minds of children. My grandson is two and would LOVE This!!! We are teaching my grandbabies and my child care kids ( all 5 under 2) about animals. and this mat would make leaning even more fun. would love to win one. I love how kids can learn 3 languages through this product. I learned they’re having a limited time special offer with free shipping on the I-Mat. This is so neat! I would love this for my 23 month old! An alphabet mat, colors or shapes mat would also be an awesome addition! Great interactive way for learning and playing! I love this & it is great that they are offering free shipping for a limited time! Love that the Voice Pen has a voice recorder! Such a neat toy! This would be great for my friends’ little ones. What a fun way to learn and a good age to start hearing different languages. Awesome educational toy! Would love to try this for my kids! I love that they stimulate creativity through play! I also love that these mats would engage all of my kids! learned they test their products with families all over the world. I learned that it plays music and animal sounds! I love that the mat teaches in English & spanish! I learned that at Creative Baby they truly believe that a creative baby is a happy baby. This is so perfect for my granddaughter, at two years old she’s so such the little sponge in absorbing all she learns. I love the mat, this would allow her to learn more about animals. I love that it makes the animal sounds. This thing is absolutely cool. I like that it has sounds, music and you can even select the language. So if your child wants to learn spanish they can with this. My daughters would love this mat. I like that they can learn more languages, too. 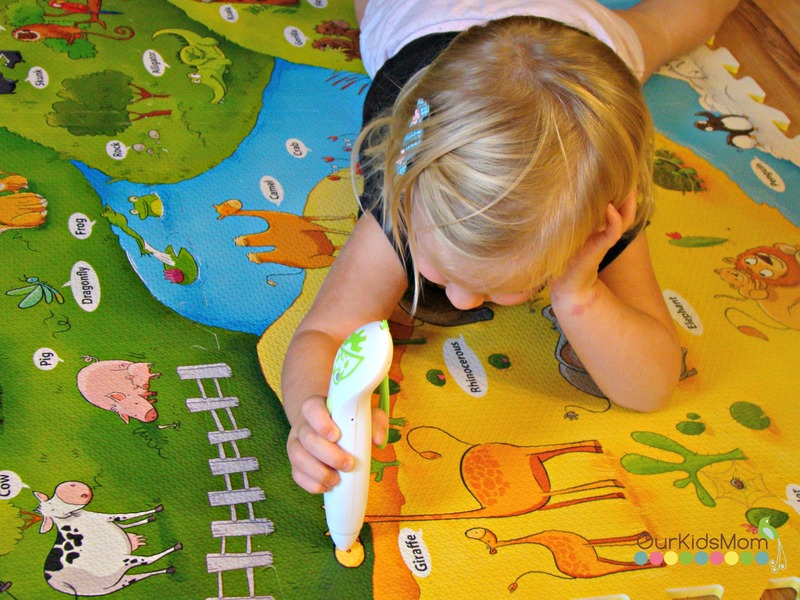 I love the voice pen that goes with the Creative Baby i-mat! I like that they offer free shipping. I love that it teaches 3 languages. I love that it also teaches in different languages, this looks like so much fun! I think my grandkids would enjoy the ipen and the under the sea mat. THe under the sea mat looks great too. I love the under the sea mat, and I love that they are easily cleaned. Thank you for the wonderful giveaway! They also sell a compatible under the sea mat! I also like the under the sea mat. I would love it my 3-year-old daughter but I think her 10-year-old big brother would play on it with her. We love toys that are fun and educational!